Slate is a natural stone product and has been used over many centuries for outdoor signage and memorial plaques. 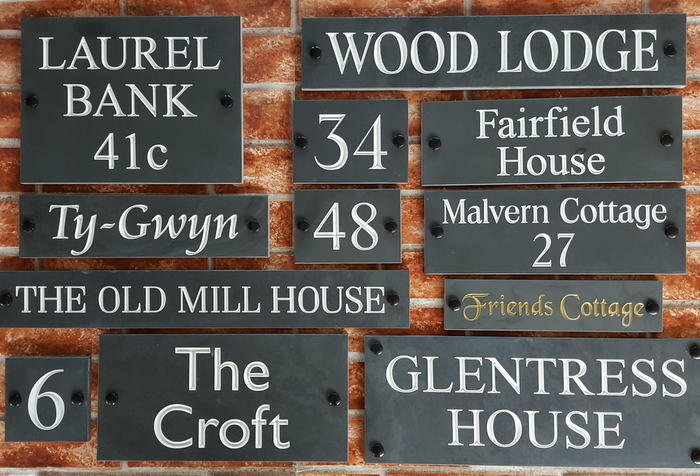 As slate is a natural material, variations in the stone will make each bespoke sign unique and appealing. For house signs slate is a great natural stone to use giving a timeless look and long lasting outdoor qualities. We use only high quality honed black slate for making our deep v-groove engraved slate signs which appears as charcoal grey in colour. The slate comes in slabs of 600mm by 600mm and calibrated to 10mm thick. We then cut the slabs down to popular sizes with our overhead wet diamond disk cutter. Black slate is quite hard and weathers extremely well outdoors. Our slate signs can can be fitted to walls, gates, wooden fencing or free standing on posts. We take pride in every sign we make from simple house numbers to larger pieces which can included both house names and address lines. Engravings are available in 19 different fonts and we can also engrave directional arrows (apart from the 100mm x 100mm size number plate) making this range ideal for directional signs. The engravings are inlaid in a choice of white, gold and silver colours and in large a choice of fonts to suit contemporary homes or properties built at different periods. If our standard sizes are not compatible with your needs, we also make bespoke sizes to suit your exact requirements from 100mm by 100mm up to 500 mm x 300 mm. Simply order a product that is a little larger than you require and let us know the exact size you require in the further instructions box when you place your order. Alternatively you can email or phone us for advice or to place your order over the telephone. No need to spend your time online trying to design a house sign. We do it for you! 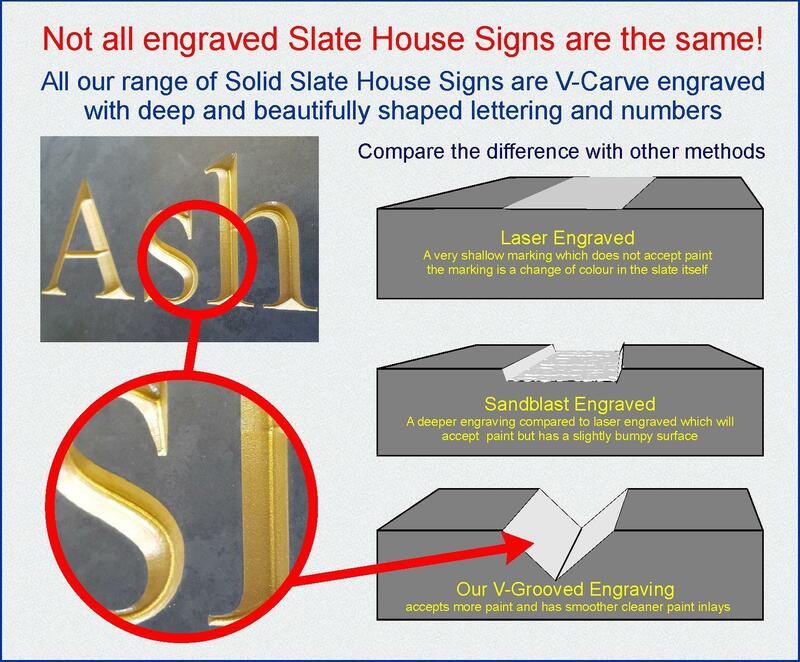 When we have received your online order, our designers will create a proof for your house sign. This will be sent via email and normally within 1 to 2 working days. You can then either approve the proof or you can request alterations until you are completely happy with the design. When we receive your approval of the proof, your house sign order is placed in our production sequence. Due to our engraving methods and the care we take to ensure that each individual product receives the utmost care with three layers of paint and a final coat of UV filtering lacquer, the average lead time for dispatch is around 2 to 3 weeks from approval of the proof. All slate signs are provided with fixings and black domed screw covers to hide the screw assembly and prevent the screws from weathering. Each product in this range has options for different fixing hole positions for easy mounting. These slate house signs can be fitted by a front door, on a gate post, on a wall, set into a wall, on stakes for use in a front garden or by the road. They can even be hung from chains providing they are not too heavy. We do not recommend slate house signs larger than 500 mm x 125 mm to be hung from chains due to their weight. Please note: We do not recommend or offer ‘hidden fixings’ but all of our slate signs can be ordered without fixing holes and you can use builders like glue (Gripfill / No More Nails) to permanently fix to a surface. Please read our blog article about why we don’t offer ‘hidden fixings’.